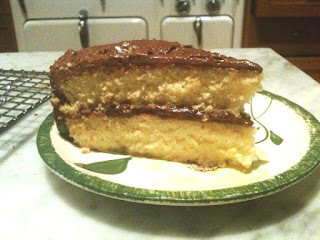 This is a lovely, moist and flavorful cake -- the best of 2010 yet. The recipe's author calls it Gold Cake, giving a somewhat richer name to what most would call yellow cake. I call it the Lipitor Special -- it has FIVE egg yolks. This is simple to make (though the technique is a bit odd) and I used vanilla for flavoring, as I didn't have any lemon flavoring. Note: The tiny bit of salt in the frosting really enhances the flavor -- this must be an early reference to today's ubiquitous marriage of salt and chocolate. this is one RICH cake!! i had to DOUBLE my dose of Lipitor this a.m.
As a big fan and follower of the Susan LaRosa culinary blog, I would ask you to make either a red velvet or a ginger cake and give a substantial portion to your husband to take to work with instructions to share with his colleagues. Alec, you may get your wish, and soon! I was invited to enter a red velvet cake contest on 2/13 and will be "practicing" beforehand. I do like my rv recipe, but want to gild the lilly, so to speak. And I'll be sure Paul brings in my efforts. Just tasted the Gold cake in. Simply delicious! Brava Susan. Can you get fat from looking at pictures? Are you sure? In these pix it's possible to see both the richness and the cholesterol! Susan: Can you do an egg-white only version pls :)?? @Al and Mark: Thanks, and look for more treats on Paul's desk in the future. @Zane: Yes, and you can get skinny from looking at pictures of salad! @Allen: The egg-white cake is an angel food cake, no fat at all, and a texture that's not unlike the pillowtop on our new mattress. this cake looks REALLLLY dangerous. i'm getting a vicarious thrill out of reading your post about it. Alas, all I can do is look, but even looking is yummy. . However, must ask that you to stop bashing eggs (well...except to break them into a bowl). 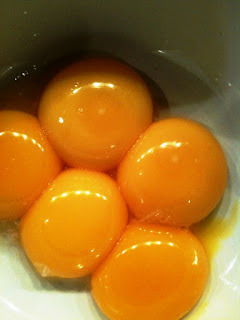 Eggs are good for you: especially farm-fresh ones with lots of omega goodness! @madmuse: Thanks for your comment. I so agree (and wish, like you, I had a sister who raised chickens for those farm fresh eggs!) but the ratio (proportion?) 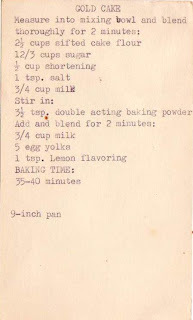 -- five egg yokes to 2.5 c flour -- in this recipe struck me as unseemly. But it was delicious! @Betty:Thanks so much for reading!! I appreciate it. Hi Susan, oops....didn't have a 9 in. 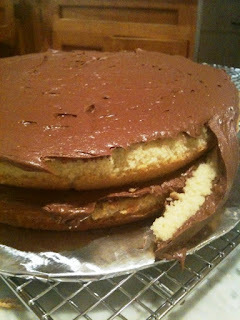 pan so used a Bundt, bad move....it fell in the middle...have to try it again with the right equipment. Miss seeing you in the halls of NYMH, Jane H.
@Jane! How exciting to see you here on my blog! Yes,please try it in the right pan. Well worth it. Can't say I miss NYM much, but I do miss seeing you, scrubs and all. Hope everything is going well and keep baking. it's nice to read this weblog, and I used to pay a visit this web site everyday.